Apex General Contracting is a proud Platinum Preferred Roofing Contractor offering lifetime warranties and exclusive homeowner benefits 99% of other roofing contractors can’t. 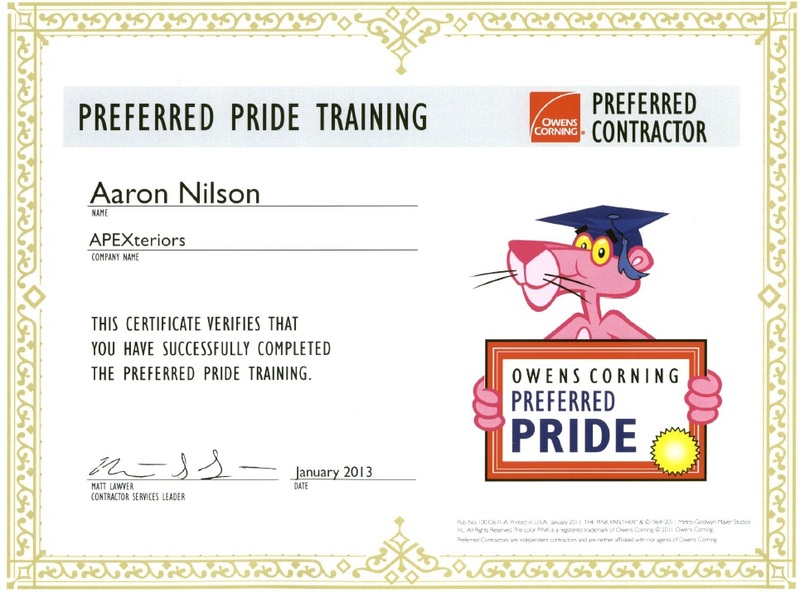 Owens Corning Roofing Platinum Preferred Contractors are hand selected by Owens Corning as the top tier of the Owens Corning Roofing Contractor Network. Platinum Preferred Contractors represent less than 1% of the roofing contractors in the industry. 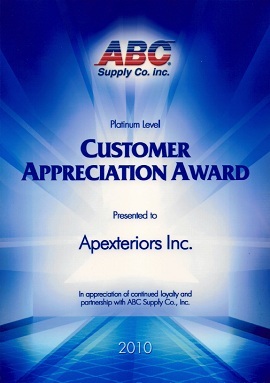 Top 500 Remodelers Apex General Contracting proudly ranks No.165 in United States and No. 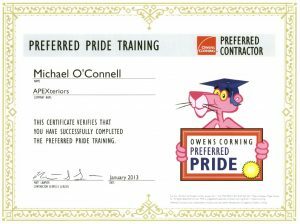 8 in Illinois for being a Top Remodeler. 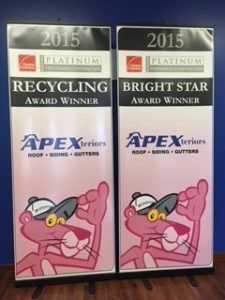 With over 50,000 applicants, Apex was analyzed by editorial staff at Qualified Remodeler and our data was verified by public records, websites and multiple different sources. 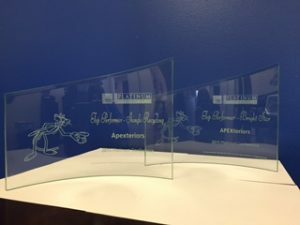 Based on Qualified Remodeler’s data analysis, the top 500 firms share excellent business acumen, a commitment to customer service, insightful sales techniques and strong customer loyalty. 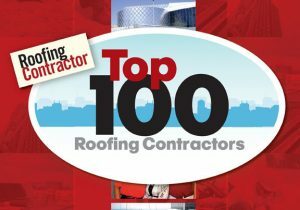 Top 100 Apex General Contracting is named one of the top 100 Roofing Contractors in the United States by Roofing Contractor magazine. In 2015 we proudly rank #74 on the list and continue to strive towards excellence in exterior repairs. With roofing, roof repair, siding installations, storm damage repair, insurance claims and restoration, Apex Exteriors is your premier choice in Missouri, Wisconsin, Tennessee, Texas, Arkansas, Kansas and Illinois. Apex General Contracting proudly pledges to recycle torn-off shingles and keep them out of landfills. We are taking an active role in helping to save the planet and the future of our environment. 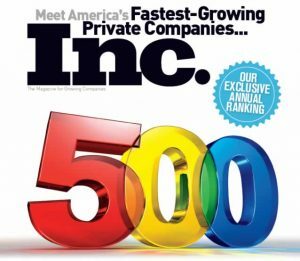 INC. 500 Apex General Contracting is named one of the 500 Fastest Growing Private Companies in the United States by the renowned Inc. magazine. The list represents the most comprehensive look at the most important segment of today’s economy, America’s independent entrepreneurs. Companies such as Microsoft, Zappos, Inuit, Jamba Juice, Zipcar, Oracle and many other well-known names have been listed beside us as fellow members of the Inc. 500 list. HAAG Certified Apex General Contracting currently holds over 20 HAAG Roof Inspector certifications. With certifications in both residential and commercial roofing, our team is trained to use scientifically based evaluation techniques to assess damage on your property. Apex General Contracting is certified in industry best practices, having participated in Owens Corning’s Preferred PRIDE program for “Professional Roofing Installation that delivers excellence”. 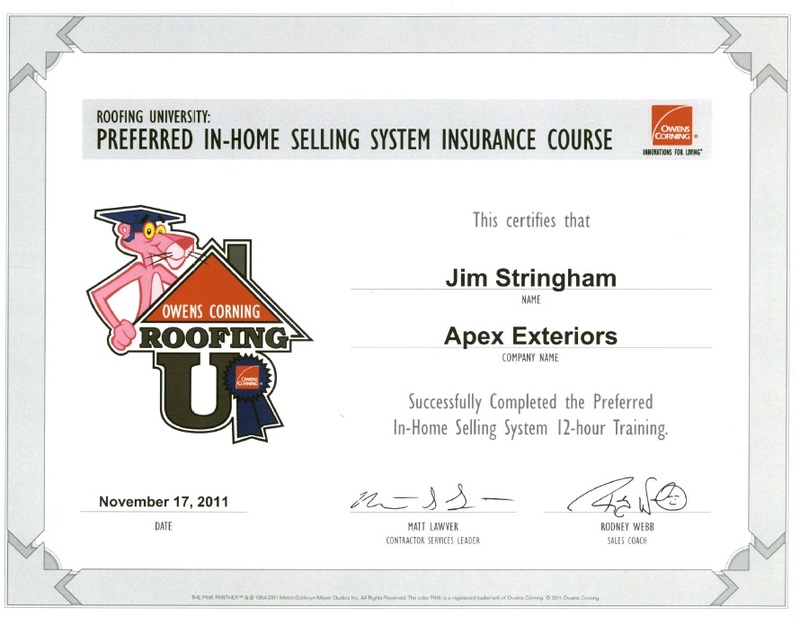 Apex General Contracting Platinum contractor Owner, Jim Stringham, successfully completed Owens Corning Roofing University’s Preferred In-Home Selling System Insurance Course. 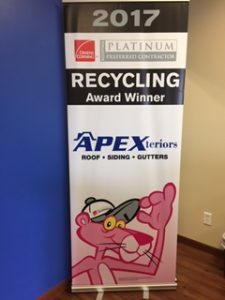 GAFCertification Apex General Contracting achieved status of Certified Weather Stopper Roofing Contractor for GAF (Residential Roofing Products Division), North America’s largest roofing manufacturer. 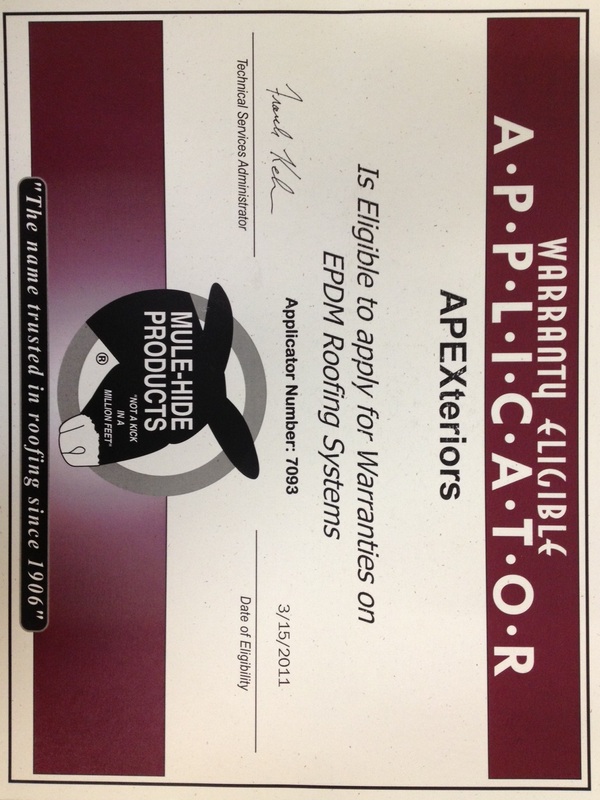 We have pledged to insure that each customer has their “best and safest choice” in roofing and are authorized to offer Weather Stopper System Plus Ltd. Warranty. 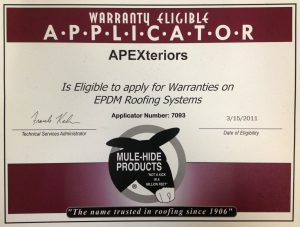 Mule Hide Apex General Contracting is Mule Hide certified allowing our team to provide you with exclusive, extended warranties. ABC Supply is a renowned national business and is the largest wholesale distributor of roofing products in the United States. 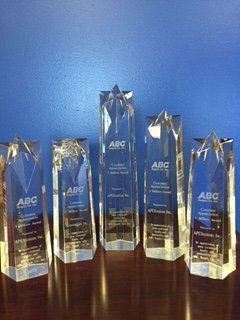 Apex General Contracting is proud to partner with ABC Supply for exterior building supplies so we can continue to provide you with the most advanced, quality building supplies available today. 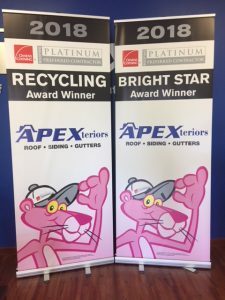 Apex General Contracting ABC Awards ABC Supply is a renowned national business and is the largest wholesale distributor of roofing products in the United States. 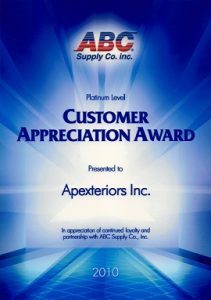 Apex General Contracting is proud to partner with ABC Supply for exterior building supplies so we can continue to provide you with the most advanced, quality building supplies available today. 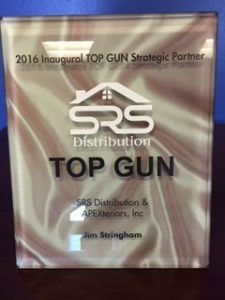 We are a strategic partner with SRS. We were picked for this award based on being a “Top Contractor” in the restoration business nationwide. By being partnered with SRS it ensures our continued success and business growth. 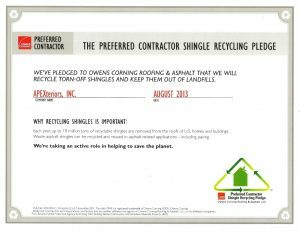 Owens Corning recognizes the top five shingle recycling volume performances nationally, measured in tons recycled. 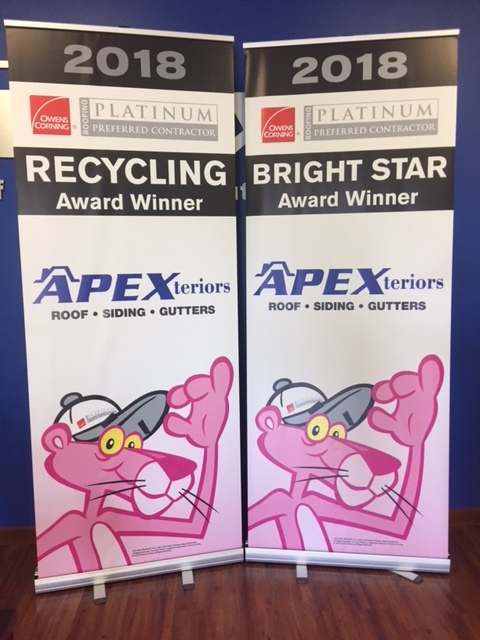 Owens Corning recognizes the best overall performance by a Platinum contractor in business growth, market leadership, safety, industry involvement, education and sales and marketing.